This Sun­day we’re hol­ding our first Soft Cir­cuits Open Lab at the Scho­ol of Fine Arts in Lis­bon (FBAUL — Facul­da­de de Belas Artes de Lis­boa). The­re is no pre­de­fi­ned struc­tu­re for the event. We will meet for the cour­se of one day with the pur­po­ses of sha­ring kno­wled­ge, expe­ri­men­ting fre­ely, advan­cing on-going pro­jects, and just having fun wor­king together. Some of the peo­ple atten­ding will be spe­ci­a­lists in elec­tro­nics and others in tex­ti­les. Bar­camp sty­le impromp­tu pre­sen­ta­ti­ons are very wel­co­me. 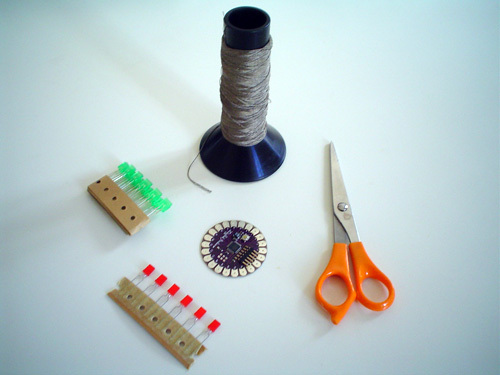 Altlab will pro­vi­de some basic tools such as pli­ers, scis­sors, sol­de­ring irons, iro­ning board, etc. But par­ti­ci­pants must bring all the mate­ri­als and addi­ti­o­nal equip­ment neces­sary for their own projects/experiments (inclu­ding lap­tops). Here are some sug­ges­ti­ons: any kind of fabric, nee­dles and thre­ad, yarn, t-shirts, con­duc­ti­ve and/or resis­ti­ve fabric, con­duc­ti­ve thre­ad, con­duc­ti­ve and/or resis­ti­ve yarn, knit­ting and/or cro­chet nee­dles, LEDs, coin cell bat­te­ri­es, bat­tery hol­ders, EL wire, strands of fiber optics, cop­per foil, cop­per adhe­si­ve track, alu­mi­num foil, resis­ti­ve foam, regu­lar foam, ardui­nos (lily­pad or any other kind). If you’ve never wor­ked with any of the­se mate­ri­als and don’t have them handy, come anyway, you can help some­o­ne else with their pro­ject and learn along the way. For more infor­ma­ti­on on soft cir­cuits tech­ni­ques and mate­ri­als, check out the Soft Cir­cuits Resour­ces sec­ti­on on the open­Ma­te­ri­als wiki. Next Next post: AZ Residency Day 1 — We Have Arrived!